To celebrate the 40th year of In The Land Of Grey And Pink’s release Caravan are releasing a very limited coloured marble vinyl double LP. Two 180g LPs consisting of the original album remastered by Paschal Byrne and three stereo mixes done by Steven Wilson (Porcupine Tree Blackfield and more) including two previously unreleased versions of “It Doesn’t Take A Lot” and “Nigel Blows A Tune” plus four non-album tracks remixed by Wilson. 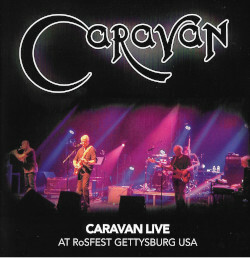 The set also includes three songs recorded live for BBC radio’s Sounds of the Seventies – “Love To Love You” “Love Song Without Flute” and “In The Land Of Grey And Pink” plus two songs recorded live for John Peel’s Sunday Concert which included a superb cover version of Soft Machine’s “Feelin’ Reelin’ Squealin’” and Caravan’s own magnum opus “Nine Feet Underground”. A defining moment in Caravan’s career and in the Canterbury progressive scene the vinyl will be available from 13th June. I have tried it today (9th May) and it does appear that you can still order this.